This lovely figurine is the second in our limited edition series inspired by the magic of fairground carousel rides. Musical horse rides date back to the Middle Ages but it was in the 19th century that the advent of steam and advances in engineering brought the carousel as we know it today to the fore, combining a horse that went up and down against a barley twist pole with a rotating circular platform. Exciting yet elegant the Carousel was favoured by fashionable ladies as their gowns and hats could be revealed to dramatic effect as they posed against the flamboyant carved and decorated horses. 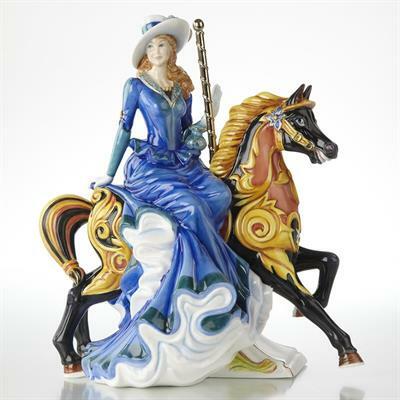 Our Merry Go Round figurine, like All the Fun of the Fair, is modelled by Valerie Annand and expert ceramic designer, Dan Smith has chosen a gorgeous deep blue for the elaborately flounced and frilled costume our heroine wears. The large, deep brimmed hat with feathers and ribbon trim frames our leading lady’s face and complements her auburn hair. The black horse with its intricate carved decoration is caught in full flight with mane flying whilst the blue flower on its bridle perfectly matches the rider’s dress. Each figurine is hand numbered and comes with a certificate of authenticity.